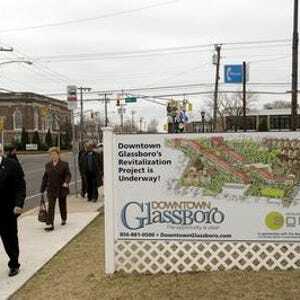 GLASSBORO – The state Economic Development Authority on Tuesday approved tax credits intended to spur construction of six buildings and a parking garage worth more than $170 million in the borough. The buildings, to be erected in two phases, would essentially complete the $350-million Rowan Boulevard project that links Glassboro’s business district with the campus of Rowan University. The buildings would rise in an area near High and Poplar streets, the former site of St. Bridget’s Catholic school. Construction would begin in April, with the final buildings to be completed by June 2018, according to the EDA. “We’re thrilled. It’s really the last major piece of the puzzle,” said Dante Germano, chief operating officer of Nexus Holdings LLC, a Lawrenceville firm that’s developing both phases. He noted the Boulevard project also will include a park, to take shape later this year at High and Main street. Each of the phases, known as A3 and A4, will support about 420 construction jobs and 110 permanent positions, the EDA said. Germano described the tax breaks as “critical,” but noted Rowan University’s growth also has been a key factor in the Boulevard’s development. The school has added 6,000 students over the past five years, providing residents for the new buildings and patrons for their shops and businesses. Germano said “spillover development” will occur in areas farther from campus as shops and restaurants draw more out-of-town patrons. “There is still much more to be developed along Main and High streets,” he predicted. The A3 phase will hold three mixed-use buildings and a seven-story, 865-vehicle parking garage, according to the EDA. It received tax credits of up to $30 million to help cover a projected cost of $102.7 million. The A3 phase will hold about 40,000 square feet of retail space, a fitness center, about 550 student beds and 36 market-rate apartments. It also will house 15 classrooms and a student lounge area, the EDA said. The A4 phase is expected to hold a pair of six-story buildings and a four-story structure, with about 20,400 square feet of retail space, 577 student beds and 30 market-rate apartments. It qualified for tax credits of up to $21 million, based on a total cost of $71.7 million. Construction of the A3 phase is expected to begin in April 2016 for completion by October 2017. The A4 phase is expected to begin construction in February 2017 for completion by June 2018. According to the EDA, Nexus will lease the borough-owned ground beneath each phase for 99 years, paying $4.2 million for each in the first year. That money “will go directly to pay down the borough’s debt that was used to acquire the properties,” said Brigandi. Rowan Boulevard has completed four phases since construction began in 2008, with Nexus serving as the sole developer since 2011. Its first phase holds almost 900 student beds in four buildings and 36,000 square feet of retail space, including a Barnes & Noble bookstore. The second phase, completed in 2012, produced the Whitney Center, a five-story building with student housing and retail space. Nexus in August completed the fourth phase, a building that holds apartments, student housing and retail space. The EDA backed tax credits of $22 million for that venture. This entry was posted in News on February 9, 2016 by Kathy Ward.